Get comfy in fan approved sweats and weather proof logo print wellies by Cuce Shoes. Another week and another miraculous come from behind victory for the Bears, but as long as it's a win I'll take it - pretty or ugly. A cold and rainy September Sunday added another dimension to both teams game plan since footing issues on the wet natural grass turf can wreak havoc. Overall the Bears and Vikings seemed to adjust to the slick field, but sloppy mistakes and gift turnovers led the Bears to another must-score final drive. The Bears special teams started off on rough footing by allowing a 105 yard kickoff return to start the game. But Hester answered and put up a career-high 249 return yards this past Sunday along with an 80 yard run to the Minnesota 23 to start off the game. With a monster game this Sunday it will be fin to see if he can match this intensity versus the Steelers in Week 3. Taking Hester off of receiving duties and back to returning only has so far been a win-win situation for the Bears. Cutler had an off game with some bad turnovers (including one in the red zone) and a fumble that turned into easy pick sixes for the Vikings and kept them in the game. Even though we were -1 in the turnover game the team didn't let the negativity dictate the game and big touch downs were made by Bennett and Marshall along with some promising rushes by Forte. The best indication of how this Bears team has improved is the final drive. Cutler remained cool and collected during the two minute drill and completed the passes we needed including a perfect TD pass to Bennett to win the game. It was a great come-from-behind win for our Bears and gave us the top spot in the NFC North. And now it's time for the FANtastic fashion. Just like the team test out your footing in a pair of Chicago Bears wedges that mix fashion and team pride. Add some texture with some slick patent pants and a throwback jersey and a statement necklace for a complete style game. 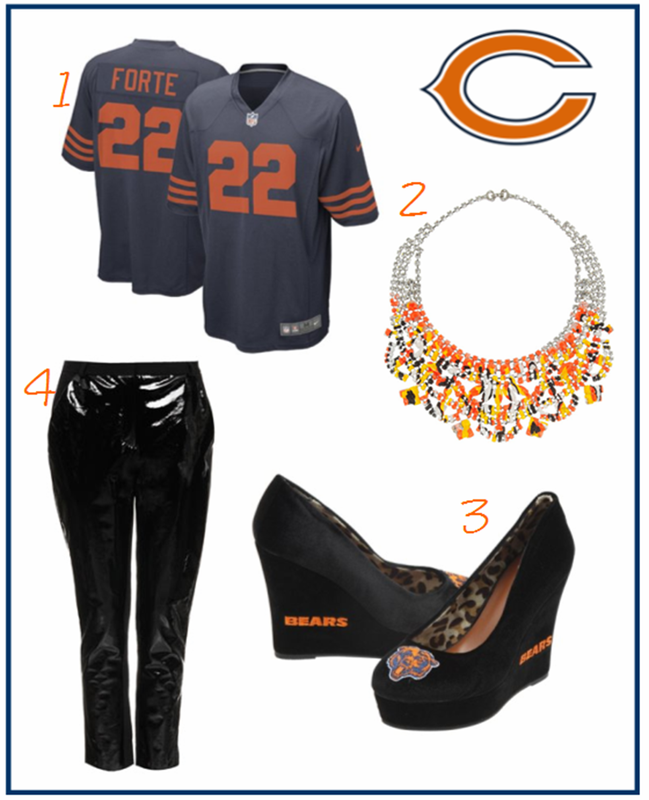 Use the hashtag #BearDownBabes and show me your Bears Fashion for Week 3!